I know this is random! 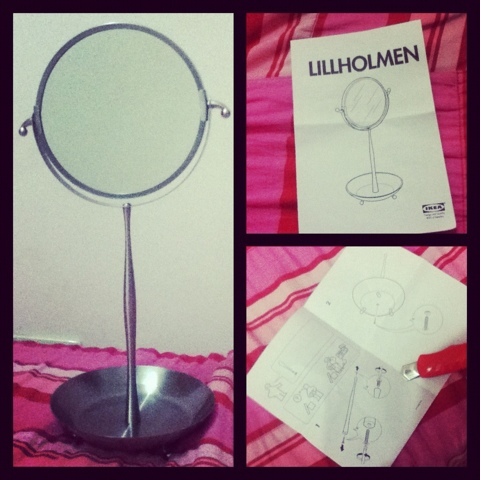 But I can't help but share the newest addition to my make up nook: The Lillholmen Table Mirror from Ikea. This was given by my sister as an advance birthday present. She was thoughtful enough to include this while hauling at IKEA. I saw an older version of this mirror from a stall at Tiendesitas that sells original IKEA products, but i hesitated buying for I find it expensive. My sister bought the more updated one for a really cheap price because it was, (and still is) the Great Singapore sale back there. Lucky me! 1. It has a magnifying mirror (magnifies 2.5 times) on one side, and a regular one on the other. 3. It is very easy to assemble. It took me around 5 minutes to get the job done! 4. It comes with a little tray on it's base to catch all your frequently used make ups and accessories. 1. It is not available locally, though there are IKEA resellers here in the Philippines, the prices they have are a bit bigger because of the shipping.